Hair donuts in two sizes -Either small and medium or medium and large, depending on the length and thickness of your hair. This set from Amazon is perfect because it comes with one of each size, so you can test out which ones work best for your hair! Bobby pins -The ones linked are the greatest bobby pins you will ever use! They are the only ones I will buy! To create this hairstyle, follow the video instructions! That is the easiest way to really see what I am talking about. I will have written instructions below the video as well! 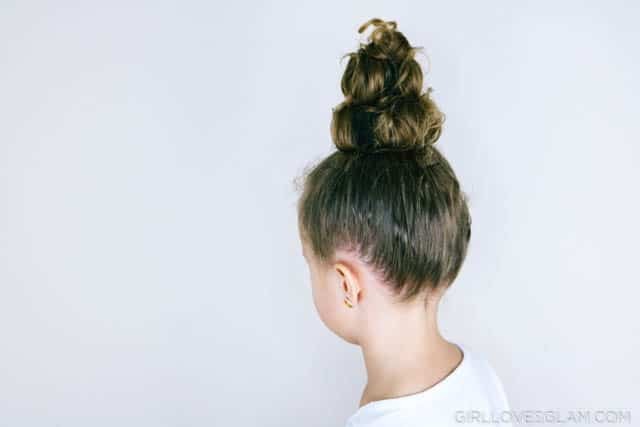 This hairstyle is so easy to create! Wet the hair down and create a smooth ponytail on the very top of the head. Put the ponytail through the larger of the two hair donuts you are using. Lay the outer layer of the ponytail around the donut, creating a layer over all of it. Put the ponytail through the smaller donut and clip the hair from the ponytail so it is out of the way. Tuck the hair that is laying over the bottom layer, back into the bottom of the donut. If you want it really nice and smooth, make sure you are wetting it down and really combing it a lot as you do this step. Tuck the top hair into the top layer and pull the pieces back out through the top to create the very tip of the poop emoji. 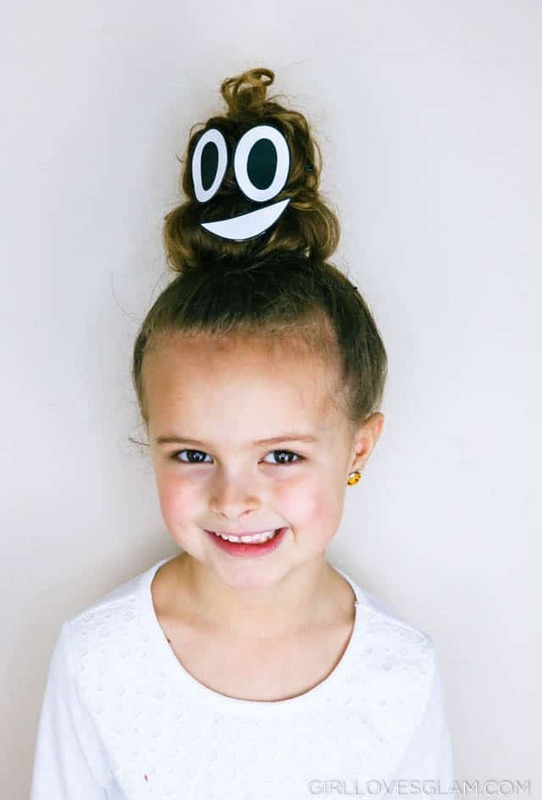 Pull the hair in the donuts into just the right shape and bobby pin everything into place. Hairspray, hairspray, and more hairspray! 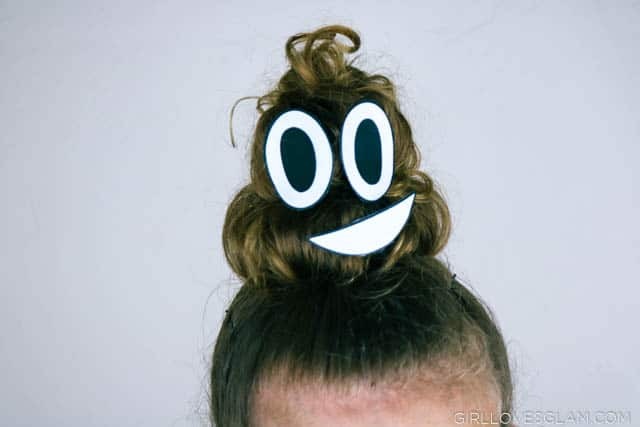 Pin the Poop Emoji face on the front of the hairstyle. To make the Poop Emoji face, download this image and print it off on cardstock paper. Click the link below to dowload the image. Place little felt rectangles through bobby pins. Add a little hot glue to the felt and stick to the back of the Poop Emoji face pieces. 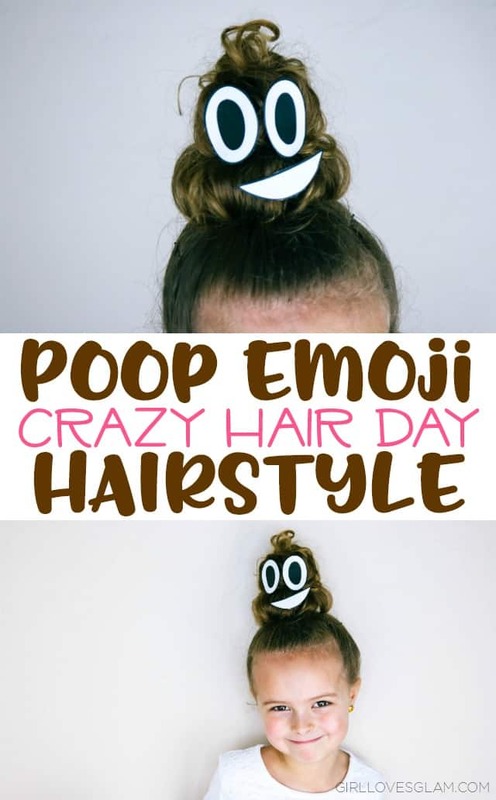 Now you have yourself a Poop Emoji hairstyle! 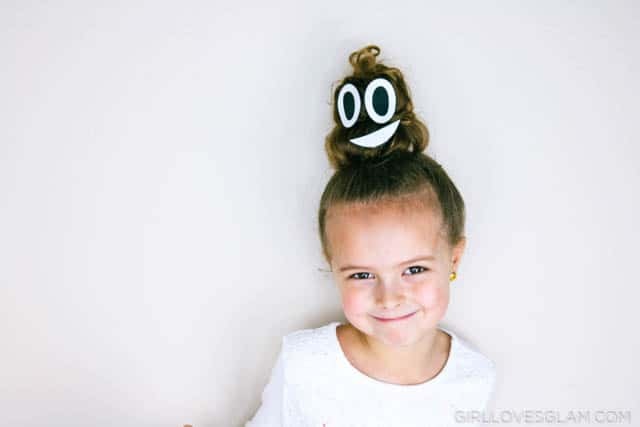 I hope you win all of your Crazy Hair Day/Wacky Hair Day contests with this hairstyle! Great job and thanks so much for the awesome idea! My 7 year old was a hit for ‘crazy hair day’ today. I didn’t have 2 bun-makers so I used a ping pong ball for the top and secured her hair with an elastic around the base. Totally worked!